I’ve been writing this here blog for a couple years now, and not once have I posted a salmon recipe. Sure, there are figs and apples from my backyard, hand-picked berries and squash blossoms, all local delicacies to be sure. But no salmon? This is ridiculous. I’m ashamed. There’s a lot to love about salmon, from the bountiful B-vitamins and omega-3 fats, to the elusive vitamin D and plenty of protein. But that’s not why I eat it; it’s delicious and free when you catch it yourself! I happen to have a surplus of filets in my freezer from last summer, thanks for an awesome fiancé who likes to fish. 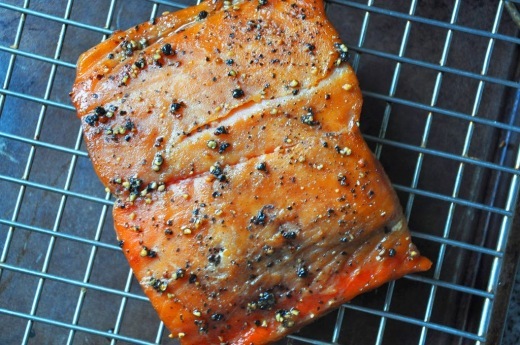 The deep red flesh of sockeye salmon is breath taking, but nothing compares to Alaskan Chinook salmon. It’s so moist and buttery, with a delicate flavor and firm, flaky texture, there’s a good reason they call it “king” salmon. A quick rubdown with olive oil, liberal showering of kosher salt and a hard pan sear are all that’s necessary to let it shine. But what about the other kinds of salmon? The pinks, steelhead, or in this case, pale (and slightly freezer burnt) chum? 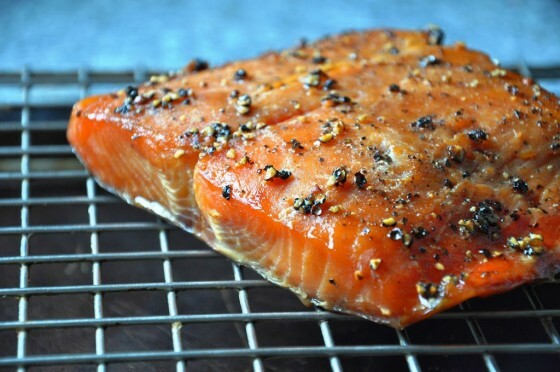 Those are fine salmon, albeit not as expensive (or special) as king salmon, and sometimes need a little extra TLC to boost their flavor. That’s where smoking comes in to save the day. There aren’t many things that elicit the oohs and aahs the way an impressive slab of smoked salmon does. It takes quite a bit more forethought than whipping up a bowl of hummus for a party, but is absurdly easy and well worth the effort. It’s luxurious, rich and highly flavored. A little goes a long way, so even a small filet of salmon is something to get excited about. 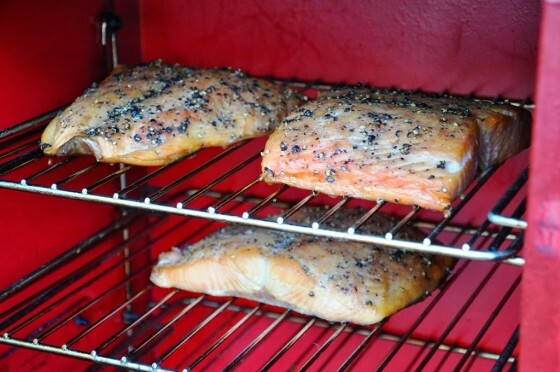 Even chum, the lowliest of salmon, eats like a million bucks when brined, smoked over alder wood chips and glazed with maple syrup and cracked black peppercorns. I have a propane Smokehouse smoker, which works great. I’m no expert though, and there are many options out there. Heck, you could even jerry rig one of your own. You could do a smaller batch, but why would you? It takes just as much propane and wood chips to smoke one pound as it does 10 and smoked salmon keeps incredibly well in the freezer. 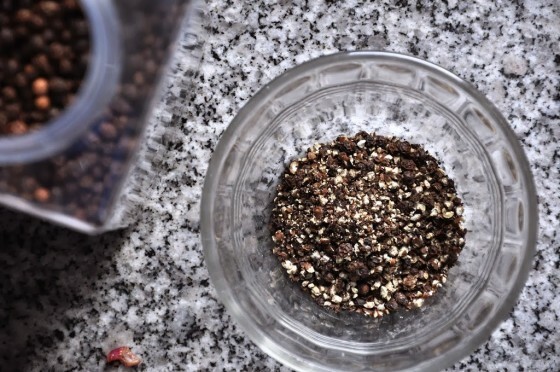 Combine the salt, 1 cup of the maple syrup,bay leaves and 1 tablespoon of the peppercorns with 1 quart of the water in a large nonreactive bowl. Whisk vigorously to combine, until the salt is mostly dissolved. Add the remaining water and whisk to combine. Place the salmon in the brine, flesh side down. Cover with plastic wrap and refrigerate for 24 hours. Place the remaining peppercorns in a plastic bag and whack with a mallet or skillet to crack them into coarse pieces. 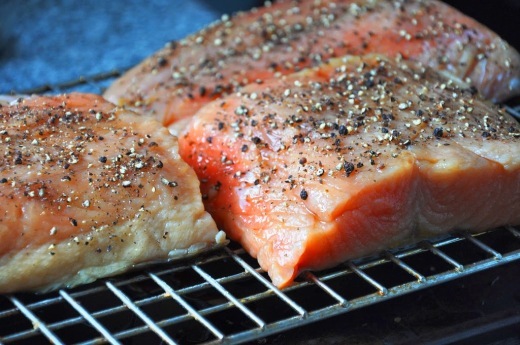 Remove the salmon to a wire rack set on a sheet pan and sprinkle liberally with the cracked peppercorns; discard the brine. Place next to a fan and allow the salmon to dry out for 4 hours, until it is shiny and tacky to the touch. This step is critical, as it forms a “pellicle”, which protects the fish from drying out and better allows the smoke to adhere to the meat. 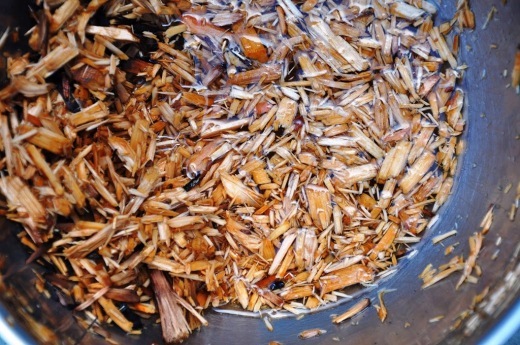 Meanwhile, cover the wood chips with cool water and set aside to soak. 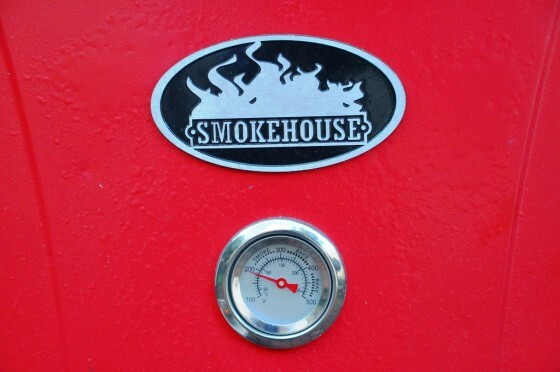 Fire up the smoker to 200°F; mine is propane, and it needs to be on very low to maintain this temperature. Fill up the little box with soaked chips, and pour 2-3 cups water in the water basin. Coat the racks with nonstick spray, then put the salmon on the racks. Close the door and wait! After one hour, open the door and brush the filets with some of the remaining maple syrup. Check to see if the water and wood chips need refilling (discard them if they are completely charred black and no longer producing much smoke and add fresh chips). Continue to smoke for another hour. Repeat this process again (glazing with maple syrup, refilling chips) until the fish has smoked for a total of 6 hours, is fully cooked (at least 145°F internal temperature) and is a deepened reddish color. Allow the filets to cool for an hour, then refrigerate until ready to serve. For longer storage, wrap in plastic wrap and store in the refrigerator for up to 10 days, or double wrap in plastic and place in a zip lock bag for storage in the freezer. Alternatively, vacuum pack and it should keep for 3 weeks or 6 months in the freezer. Recipe states 3 separate quantities of maple syrup and no sugar, yet method states sugar? Hey David, thanks for catching that! My base recipe uses brown sugar, which I swapped for maple sugar this time, hence the typo (now corrected!). Either would be great. What I actually did over the weekend was to substitute your (erroneous – no… turned out to be delicious!) – cup of maple syrup for a cup of brown sugar, and retained the other quantities of maple syrup. It was not too sweet, and I started with cold smoking for 2 hours with alder wood before upping the heat to arrive at an internal temp of 140. Definitely! And lox. We’re both in the Pacific NW and have great access to the best salmon so, yes. I also have a small farm and rear my own meat so this past weekend started pancetta, bacon, and made 10lbs Spanish chorizo which is now hanging and curing in my (delightfully fragrant!) office. 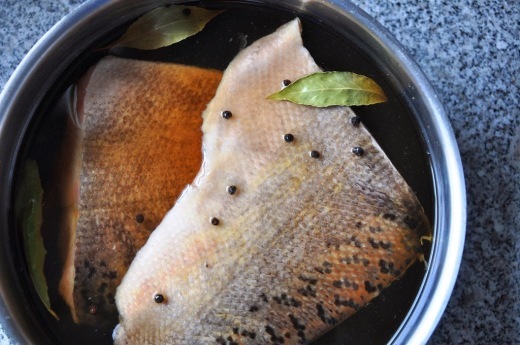 Do you rinse the brine from the fillets before setting them to dry? Hi Mary, no rinsing necessary! Just proceed with the drying process. Happy smoking!